The Goddess Shawl will make you feel as beautiful as Aphrodite! 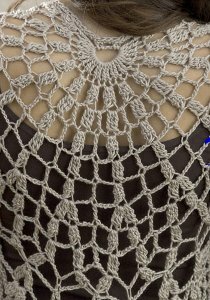 This stunning free crochet shawl pattern covers your arms while also allowing air to pass through so you don't get too hot while wearing it during the warmer months. This design makes a perfect cover-up for summertime events, like outdoor weddings and dinner parties. The cool-toned taupe color will match with practically anything, so you can pair this gorgeous shawl with almost any outfit. Follow the easy step-by-step instructions below to learn how to make this beautiful lacy design. 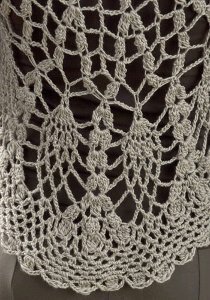 NotesThis shawl was inspired by a vintage doily pattern. Crochet GaugeIn pattern stitch, 24 sts and 3 1/2 rows = 4"/10 cm. Exact gauge is not critical for this project. Chain 10; taking care not to twist ch, join with slip st in first ch to form a ring. Row 1: Ch 4 (counts as first tr), work 22 tr in ring, turn—23 tr. Row 2: Beg-trCl in first tr, *ch 3, skip next tr, trCl in next tr; repeat from * across, working last trCl in top of turning ch, turn—12 clusters. Row 3: Beg-trCl in first trCl, *ch 2, tr in next ch-3 space, ch 2, trCl in next trCl; repeat from * across, turn—12 clusters and 11 tr. Row 4: Beg-trCl in first trCl, *ch 3, tr in next tr, ch 3, trCl in next trCl; repeat from * across, turn. Row 5: Beg-trCl in first trCl, *ch 4, tr in next tr, ch 4, trCl in next trCl; repeat from * across, turn. Row 6: Beg-trCl in first trCl, *ch 5, tr in next tr, ch 5, trCl in next trCl; repeat from * across, turn. Row 7: Beg-trCl shell in first trCl, *ch 4, tr in next tr, ch 4, trCl shell in next trCl; repeat from * across, turn—12 shells and 11 tr. Row 8: Beg-trCl in first trCl, ch 5, trCl in next trCl, *ch 3, tr in next tr, ch 3, trCl in next trCl, ch 5, trCl in next trCl; repeat from * across, turn—24 clusters and 11 tr. Row 9: Beg-trCl in first trCl, ch 9, trCl in next trCl, *ch 3, tr in next tr, ch 3, trCl in next trCl, ch 9, trCl in next trCl; repeat from * across, turn. Row 10: Beg-trCl in first trCl, ch 5, sc in 5th ch of next ch-9 space, picot, ch 5, trCl in next trCl, *picot, trCl in next trCl, ch 5, sc in 5th ch of next ch-9 space, picot, ch 5, trCl in next trCl; repeat from * across, turn—24 clusters. Row 11: Beg-trCl in first trCl, ch 5, 6 tr in next picot, ch 5, *trCl shell in next picot, ch 5, 6 tr in next picot, ch 5; repeat from * across to last trCl, trCl in last trCl, turn—11 shells, 2 clusters and 12 6-tr groups. Row 12: Beg-trCl in first trCl, ch 5, sc in next tr, [ch 6, sc in next tr] 5 times (beginning of pineapple), ch 5, *trCl shell in ch-3 space of next trCl shell, ch 5, sc in next tr, [ch 6, sc in next tr] 5 times, ch 5; repeat from * across to last trCl, trCl in last trCl, turn—11 shells, 2 clusters, and 12 pineapple beginnings. Row 13: Beg-trCl in first trCl, ch 6, [sc in next ch-6 space, ch 6] 5 times, *trCl shell in ch-3 space of next trCl shell, ch 6, [sc in next ch-6 space, ch 6] 5 times; repeat from * across to last trCl, trCl in last trCl, turn. Row 14: Beg-trCl in first trCl, ch 6, skip next ch-6 space, [sc in next ch-6 space of pineapple, ch 6] 4 times, *trCl shell in ch-3 space of next trCl shell, ch 6, skip next ch-6 space, [sc in next ch-6 space of pineapple, ch 6] 4 times; repeat from * across to last trCl, trCl in last trCl, turn. Note: Take extra care when working Row 15. trCl shell-INCREASE is worked instead of regular trCl shells. Definition of trCl shell-INCREASE is given in the Special Terms section (above). Row 15 (trCl shell INCREASE row): Beg-trCl shell in first trCl, ch 6, skip next ch-6 space, [sc in next ch-6 space of pineapple, ch 6] 3 times, *trCl shell-INCREASE in ch-3 space of next trCl shell, ch 6, skip next ch-6 space, [sc in next ch-6 space of pineapple, ch 6] 3 times; repeat from * across to last trCl, trCl shell in last trCl, turn—11 shell INCREASES, 2 shells, and 12 pineapples. Row 16: Beg-trCl in first trCl, ch 3, sc in next ch-3 space, ch 3, trCl in next trCl, ch 6, skip next ch-6 space, [sc in next ch-6 space of pineapple, ch 6] twice, *[trCl in next trCl, ch 3, sc in next ch-3 space, ch 3] twice, trCl in next trCl, ch 6, skip next ch-6 space, [sc in next ch-6 space of pineapple, ch 6] twice; repeat from * across to last shell, trCl in next trCl, ch 3, sc in next ch-3 space, ch 3, trCl in last trCl, turn—37 clusters, and 12 pineapples. Row 17: Beg-trCl in first trCl, [ch 3, sc in next ch-3 space] twice, ch 3, trCl in next trCl, ch 3, sc in next ch-6 space, ch 3, (sc, ch 3, sc) in next ch-6 space (pineapple point), ch 3, sc in next ch-6 space, ch 3, **trCl in next trCl, *[ch 3, sc in next ch-3 space] twice, ch 3, trCl in next trCl; repeat from * once more, ch 3, sc in next ch-6 space, ch 3, (sc, ch 3, sc) in next ch-6 space (pineapple point), ch 3, sc in next ch-6 space, ch 3; repeat from ** to last 2 trCl, trCl in next trCl, [ch 3, sc in next ch-3 space] twice, ch 3, trCl in last trCl, turn. Row 18: Ch 5, sc in next ch-space, *ch 3, sc in next ch-space; repeat from * across skipping all trCl to last trCl, ch 3, slip st in last trCl, turn. Rows 19–22: Ch 5, sc in first ch-space, *ch 3, sc in next ch-space; repeat from * across, turn. Do not fasten off. Row 1: Ch 5, sc in first ch-space, *ch 3, sc in next ch-space; repeat from * across, ch 3, sc in same (last) ch-space again (for corner); pivot to work along top edge, **ch 3, sc in end of next row; repeat from ** across working (sc, ch 3, sc) in center of beginning ring; ch 3, join with slip st in 2nd ch of beginning ch-5, do not turn. Row 2: Beg-trCl in same st as join; *ch 3, slip st in next ch-3 space, ch 3, trCl in next ch-3 space; repeat from * across to opposite top corner, ending with ch 3, slip st in corner ch-space; working along top edge, work 3 sc in each ch-space across; join with slip st in Beg-trCl. Fasten off. Using yarn needle, weave in ends. If desired, block lightly. Beginning treble cluster—Ch 4, yarn over twice, insert hook in indicated stitch and draw up a loop, [yarn over and draw through 2 loops on hook] twice (2 loops on hook); yarn over twice, insert hook in same stitch and draw up a loop, [yarn over and draw through 2 loops on hook] twice (3 loops on hook); yarn over and draw through all 3 loops on hook. Treble cluster—Yarn over twice, insert hook in indicated stitch and draw up a loop, [yarn over and draw through 2 loops on hook] twice (2 loops on hook); *yarn over twice, insert hook in same stitch and draw up a loop, [yarn over and draw through 2 loops on hook] twice; repeat from * once more; yarn over and draw through all 4 loops on hook. Beginning treble cluster shell—(Beg-trCl, ch 3, trCl) in indicated stitch. Treble cluster shell—(trCl, ch 3, trCl) in indicated stitch. Treble cluster shell increase—([trCl, ch 3] twice, trCl) in indicated stitch. Ch 6, slip st in top of last st made. Hi there! I believe it means you should do the picot stitch (Ch 6, slip st in top of last st made) then ch 5 more after that and continue. I hope that helps! There are also a ton of helpful comments troubleshooting this pattern as you scroll down. I hope some of the insight other crocheters have offered also helps with this pattern! Yes it is. And there is extensive troubleshooting there as well by users who have made the shawl. Goddess shawl is so beautifully made I want one! In the color specified in this pattern. Wouldn't change anything. Hi there, For specific pattern-related questions, we suggest contacting the pattern designer directly (Caron Yarn). There is a link in the byline above (below the project name). We also suggest posting your question on Facebook - our fans love to help one another. Thanks! Just now seeing this as I am currently making this one. I found that it seems to be missing a row of instructions. Starting with Row 8 I did a chain 3 instead of chain 5. Then trCl in same trCL instead of next. Because looking at the picture, that seems to be the row where you start to do 2 trCl in the same trCl. Then for Row 9, I did chain 5 instead of chain 9. Then I repeated row 9 with the original count of the chain 9. That worked for me. Then Row 10 became row 11 and so on. After that the instructions worked as written so far. help please I'm stuck with row 7 & 8 row 8 has 24 clusters but I have only 22 .. I've made two of these and just deciding on a new colour before starting on the next. I made a smaller version for my 8yo daughter by using trebles (US double crochet) in stead of the double trebles and it scaled down beautifully. Thanks for a great pattern. Why doesn't the pattern indicate how many picots you make during Row 10? It only mentions 24 clusters. Kindof leaves me hanging. I'm curious about Row 1...do I end the row with sl st at the top of the ch-4 and then turn OR just turn without sl st at the ch-4? So I guess I'm not working a circle?? re: Row 1. You are not going to be working in a circle but you are working out of a semi-circle at the base of the back of the neck. help stuck on row 10 what do you do with the 11 trebles from 8 and 9 am I missing something? help it was going so well and looking great! can somrone tell me what I am missing? I am having the same problem.. Where is the corrected pattern? I am done with the shawl, but I am stuck at the edging, I have no idea how to pivot, can someone help? Does anyone happen to have a picture of the picot stitch portion of row 10? I understand how to do the stitch in general, but I don't understand "slip st in top of last st made"
I'm still lost on the edging. Are there any diagrams/videos...anything to help with just the edging???? Greatly appreciated. I'm nearly to the edging. I admit I've had a couple of do overs along the way. I just wondered if you got any response to your request for help. I'm almost finished with the last row of edging on this and I must say the only trouble I've had with it is when I did not trust the pattern (rows 10 and 17) or when I didn't read carefully (row 10) and possibly once when I had one too many glasses of wine ;). This is a gorgeous shawl! I used 2nd Time Cotton by Knit One Crochet Too (a recycled cotton/acrylic blend) and I've shown it as I've been completing it and gotten many compliments. It's a very easy pattern when you trust it and it comes along very quickly with the tall treble stitches. I started 8 days ago and will finish this morning. Thank you for the pattern! how do you make a folder? I made this in a blue self striping boucle yarn - absolutely beautiful - you can see the pattern in the boucle, which I've found is very hard to accomplish with most patterns. I love the drape and the pineapples - delicate without being too "old fashioned". Caron has some very beautiful patterns that they offer for free. I'll make a few more of these for the fall. This is a lovely shawl and I'm finally almost finished. So much fun to crochet. I have a question on the Edging - second row. It states "ch 3, slip st in next ch-3 space, ch 3, trCl in next ch-3 space" - I have chained 3, but don't know how to proceed to chain 4 for the beginning of TrCl. Do I do that in the slip stitch ch3 space (and have 7 chains in a row - or is there a stitch in the next chain before the ch 4 start of the TrCl? Thank you. hey did you ever get a reply to this? Hi, love this pattern thanks! It's so quick to do I made it as a gift for my sister in a week in any spare moments i could grab between work, kids and socialising. I'm starting one for me now! Just a note for any other non-American crocheters out there; be aware that American patterns are not the same as English ones; the stitch names are the same but generally refer to different stitches! (eg: American sc= English dc , etc) If in doubt, check this out in a book where they actually show the stitches being worked and you'll see what I mean. To anyone having trouble working this shawl, read the pattern closely row by row and don't try to second-guess; do just what it says. I found it to be absolutely correct. All the best; happy crocheting! Can someone help me with these directions to the Goddess Shawl??? On row 16 it says Beg-trCl in first trCl, ch 3, sc in next ch-3 space, ch 3, trCl in next trCl, ch 6, skip next ch-6 space, [sc in next ch-6 space of pineapple, ch 6] twice, *[trCl in next trCl, ch 3, sc in next ch-3 space, ch 3] twice, trCl in next trCl, ch 6, skip next ch-6 space, [sc in next ch-6 space of pineapple, ch 6] twice; repeat from * across to last shell, trCl in next trCl, ch 3, sc in next ch-3 space, ch 3, trCl in last trCl, turn37 clusters, and 12 pineapples. Do I really skip all the first pineapple stitches??? That creates a large hole. Any help would be appreciated. On my piece I have the beg-trCl and then it is the pineapple, then the cluster of 3 tr-cl, then another pineapple. Have just completed Goddess Shawl, and loved every minute of it. Can somebody tell me has the one shown in pattern been caught somewhere to make it appear to have sleeves ?? Yes, the way it's worn in the picture is a bit misleading isn't it? It would be easy enough to add a fastening at the front and catch it in under the arms with a stitch on each side once you see how it fits you, as it does look pretty worn that way. I love the one I made so much that I want to make at least another 2! Love the shawl, but could someone please tell me if there is an error on 11. Row 10: Beg-trCl in first trCl, ch5,sc in 5th ch of next 9ch space, picot, ch5, trCl in next trCl, ?picot?, trCl in next trCl, ch5, sc in 5th ch of next 9ch space, picot, ch5, trCl in next trCl; repeat from * across, turn - 24 clusters. The error is where I have placed ? I have followed it twice as printed but it looks wrong, help please. Have just done it 3rd time and looking ok, so my mistake, whoops !! Sorry. This beautiful shawl is on my must make list.Shall make it as soon as its cool enough to pull out my woolen yarns. How much yarn is needed to crochet this??? Thanks, I didn't know you could do that. is there a way to PRINT the comments as well?? There are some good notes here from prev hookers that I would like to keep with the pattern. why cant I print the first pg to all of your paterns? I, too, had trouble with row 16 and redid row 15 three times before I checked the website to see if anyone else was having difficulty. That is where I discovered my mistake regarding the beg. tr cluster shell secret. I have learned to slow down and read the instructions more carefully. Thanks for your help. The project is now almost completed. Are you ending up with 22 instead of 24? Perhaps you missed that the first and last clusters in row 7 are actually cluster shells? Your shawl appears to be fastened together under the arms, to form sleeves, the pattern does not show this.The shawl is also fastened in the front, and the pattern does not show this either. If you are having trouble on Row 16 go back and redo Row 15. I made the mistake of just doing Beg trCl instead of a Beg trCl SHELL. So in the end there are supposed to be two clusters instead of one. Small mistake but I found where everyone is getting stuck on this row. Here are some clarifications that helped me so far... I have just completed Row 12. Row 7 - is the first time we see the Beginning Treble Cluster SHELL - as opposed to the Beginning Treble Cluster. The SHELL is twice as big as the cluster! The Treble Cluster SHELL is written (trCl, ch 3, trCl). It is helpful to circle all clusters, shells, and increases in the pattern so you don't accidently miss them. Later on in Row 15 (the pattern does call attention to it) there is a treble cluster shell INCREASE and it is written ([trCl, ch3]twice, trCl). Row10 - the second picot is made in the top of the next tr, from the row below. This worked as I completed Row 11 with no problems. When I first started crocheting, following the directions used to be confusing with a pattern like this so I would write out in long hand the directions, limiting just one instruction to a line and if the abbreviations are confusing for you - write out the whole word. I also would recommend a size "I" hook for this pattern if I ever made it again. I remember what it was like to be a beginner. I was self-taught so I had lots of problems but no one to help me. Now with computers, others are just a click away - I think in the interest of carrying on the craft and what it means to love crochet we should extend ourselves to each other happily... that's just how I see it. I am making the goddess shawl and am stuck on row 16. Do i skip the ch6 and pineapple and ch6 then sc in the ch3 of trcl increase? it seems too far but that is the next ch3 i have. What do i do? After reading the comments I see that Row 10 has puzzled many of us. Can anyone tell me where the picot goes? I am almost through with my second one and have not found any mistakes, just take it one step at a time. My husband thought the first one was so beautiful, he told me to go buy a dress to go with it! I made this in less than a week in my spare time with two small kids. I found it to be quite clear, and one of the easier patterns I've done. I really don't understand what the confusion is, because if you read what you're supposed to do it works exactly right. It's a beautiful shawl! I think the reason there's trouble on row 10 is because row 9 is missing 2trCl in each trCl because by the end of row 9 there are supposed to be 24trCl, and 11 tr. I'm just afraid to alter it until there's been some sort of official correction because I want it to fit correctly. HELP! Hi, I'm having trouble with row 10 also! I have flown through the pattern up till now but I am not understanding the placement of the picot... I get that the 1st one goes in the 1st sc, but on the next one, does that go into the next trCL? after the 1st picot the pattern says "ch 5, trCL in next trCL, *picot, trCL in next trCL, ch5, sc in 5th chain of next ch-9 space, picot, ch5, trCL in next trCL; repeat.... so from the * where does THAT picot go, in the top of the trCL you just did or does it go into the next trCL before you do the trCL??? Please help I'm so confused and really was loving this pattern until now!!!!!! I'm stuck on row 16. It says " Beg-trCl in first trCl, ch 3, sc in next ch-3 space, ch 3, trCl in next trCl, " but the row above didn't have ch-3's until the trCl shell INCREASE. Where is the first sc placed? After the Beg-trCl, I've got a ch-6 and then the bottom of a pineapple. Goddess Shawl is the third name given on favecrafts.com for this shawl that I have found in less than a week. However, this time I now have a designer name - by Karen Drouin for Naturally Caron. As I am relatively new to favecrafts.com can anyone tell me if it is customary to keep changing the name for a popular pattern. I have patterns that date back to the 40's and never saw one with a name change and ran again. I've tried and tried row 8. Not coming up with the 24 clusters and 11 triples. Only 12 clusters and 6 triples. What am I missing? Just wanted to say thanks to DS's post on july 29. I appreciate your picot stitch tip. When put together with the photos it all made sense! Woo Hoo! This is fun! How many projects do I have going now? Hmm. Never a dull moment. I used James G. Brett's marble yarn in amythest and it is so beautiful. This pattern worked up so quickly and I had no problem with the directions. I'm going to make several others for Christmas gifts. Looking at the directions for the picot stitch......it's not worked into the row below. It says to chain 6 then slip stitch into top of last stitch made. So in #11 (row 10) where it says chain 5, sc in 5th chain of ch 9 space. That next picot is worked into the top of that sc that you just made.....not into the base. Does that make sense? I'll try to be more clear if you need me to be......happy stitching! o.k. I completed the shawl by Saturday and wore it over a brown dress. I got numerous compliments. I also brought the shawl to my knit/crochet group and everyone absolutely loved it. I found the shawl to come more fuller than the picture showed and as I posted previously, I would have used a smaller hook. I have been crocheting for many, many years and this is one of the hardest projects I have made. I had to be in complete silence to follow the instructions. As I said in my previous post, Row 10 was confusing. I worked it out with where to put the picot; but, to be honest, I can't tell you what I actually did. All I can say is that the finished product was beautiful!!! P.S. if I have time, I'll sit down and figure out where the picot goes on Row 10 and post it. good luck everyone!!! Did you ever figure out what you did right??? I am stuck on row 10 - where does the picot go after the asterisk? I am making thus shawl and have gotten to Row 10. It says ch 5, trCl in next trCl, *picot, trcCl in next trCl, ch5, where does the picot go? Is it made in the 5th ch of 9 space? If so why doesn't it say so? can anyone help me as I am making this for my 2 aunts who are in their 70's. Just started tonight, got to row 11. No problem yet. So far the instructions are very good and easy to follow. Hey, and I'm German... Until recently American crochet instructions were like Chinese for me... :-) What is it after row 6 that causes you problems? Is it the shell? The shell is made of 2 clusters with chain in between. Let me know. Maybe I can help. I am making this Goddess Shawl. I find it confusing that each step is numbered and does not coincide with the Rows. Anyway, I got stumped with #11, Row 10. The instructions didn't indicate where to put the picot. So far, I am up to #17, Row 16. It seems to be coming out right. I guess I won't know until I finish it. I'll try to remember to come back on here and post more comments. I know one thing. I'm sorry I didn't start this shawl with an "I" hook instead of a "J". I guess I crochet loosely. I found it a little hard to check the gauge. I'm hoping to finish this by Saturday as I plan to wear it out. I hope my comments have helped you. Has anyone tried to make this Goddess Shawl using these instruction and did you have trouble with the instruction? Looking at the instruction and counting the rows on the picture something is not right. I do not know if it is the instruction or what, I need help I'm at row 6 instuctions and can't get any futher. Help please if you can.